Defend Immigrant Students! Immigration Police and All Cops Off Campus! Defend Muslims and the Rights of Us All! 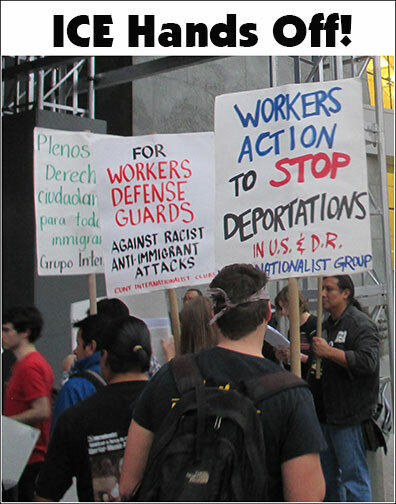 The election of arch-racist Donald Trump to the presidency of U.S. imperialism has set off a wave of fear of mass deportations among immigrant workers and students in cities across the country. Spouting vile anti-immigrant and anti-Muslim rhetoric throughout his campaign, Trump promised to end the Obama administration’s supposed “non-enforcement policies” on immigration in the first days of his term. His nominee for U.S. Attorney General, Jeff Sessions, has been a virulent opponent of the DREAM Act and along with the Republican majority in Congress has vowed to cancel Barack Obama’s DACA (Deferred Action for Childhood Arrivals) program. There are an estimated 6,000 undocumented students at the City University of New York who are directly threatened. Immigrant and Muslim students and their families must be defended by all CUNY students, faculty and staff, as well as by all defenders of democratic rights. To do so, we must be clear about who we are fighting against. While Republican candidate Trump vowed to deport all undocumented immigrants (underestimated at 11 million people), the Democratic Obama administration during its first seven years deported over 5.5 million undocumented immigrants (including “removals” and “returns”), in addition to another 2.7 million “voluntary departures.” Moreover, the legal basis for the deportations of undocumented immigrants is the 1996 “Illegal Immigration Reform and Immigrant Responsibility Act” enacted by the administration of Bill Clinton. In short, both the partner parties of American capitalism are enemies of immigrants. In the aftermath of the election, there has been a dramatic spike in racist attacks, including on university campuses. This poses an urgent need to organize defense of immigrant students, as well as of African Americans, Latinos, Muslims, Native Americans, gays, lesbians and other targets of violent assaults. Beyond this, the Trump victory has given rise to the “sanctuary campus” movement – a push to make college campuses “sanctuaries” for undocumented students. While supporting this demand critically, we warn against liberal illusions. The Cosecha movement which is promoting this seeks to “claim spaces of resistance and protection for our country’s most vulnerable people.” It calls for “sustained mass non-cooperation” through such measures as consumer boycotts “of one business at a time” leading to a “general strike” (defined as “not going to work or school for seven days”). As revolutionary Marxists, we support banning ICE from campuses, forbidding campus authorities from cooperating with them, and keeping information about undocumented students secret. But we do not look to the campus administration – which runs CUNY on behalf of the ruling class – as the defenders of immigrants. We vividly recall how CUNY cops, together with NYPD riot police, viciously attacked student protesters in November 2011 at a Board of Trustees meeting at Baruch College. The police (as well as rent-a-cop security guards) are all part of the repressive apparatus of the capitalist rulers, the backbone of their state, of which ICE, the Border Patrol and other “Homeland Security” officials are an integral part. These enforcers of bourgeois “law and order” must be opposed by those who stand with undocumented students and workers. Moreover, calling on the federal government – under Donald Trump, no less – to protect undocumented immigrants, or on New York governor Andrew Cuomo (who repeatedly sacrificed the DREAM Act in budget negotiations) to aid immigrant students is not only a diversion, seeking to get the oppressed to rely on their oppressors, it is positively delusional. The CUNY Internationalist Clubs say: All cops off campuses! ICE, hands off our fellow students! And contrary to the Democrats’ fraud of an immigration “reform” that would provide a “path to citizenship,” we call for full citizenship rights for all immigrants, underscoring that in this imperialist epoch such a basic democratic demand can only be achieved by a workers government. Defenders of immigrant rights, and the rights of all the oppressed, must fight tooth and nail against all attacks whether from the state or racist individuals or gangs, and the sentiment to create “sanctuaries” for the persecuted, as many churches did in the 1980s, is positive. But campuses will not be islands of security in a sea of reaction any more than they can be “ivory towers” isolated from the rest of capitalist society. The official assault on immigrants will likely take place outside the halls of academe. The Obama administration was well aware that it could stir up a hornet’s nest of opposition by carrying out migra arrests in schools, universities, churches and hospitals and issued a November 2011 ICE memo cautioning about undertaking actions at such “sensitive locations.” Even a Trump administration may hesitate to do that. Calls on city, state and federal governments as well as campus administrations to “protect” immigrants create dangerous illusions about where the threat comes from. We can only rely on our own power. To that end, the PSC should issue a statement that it will defend immigrant students, faculty and staff and their families, as well as all those subject to racist attack, and join in preparing for mass labor-immigrant action to defend those at risk and to stop deportations. Other unions and all opponents of racism and defenders of immigrants’ rights should do likewise, and students should massively participate in such an initiative to organize active working-class resistance independent of the bosses’ state, parties and politicians. This should be given organizational form with committees on every campus, setting up phone trees, using social media and forming networks for rapid response and outreach. Trump has also threatened to cut off funds to “sanctuary cities” which have refused, in different degrees, to cooperate with ICE police, most commonly by refusing to hold those arrested on minor charges for deportation. In his Cooper Union speech, de Blasio vowed that in the face of calls for a registry of Muslims, NYC would “take legal action” to block it; that the city would not “tear families apart” (and single immigrants? ), that it would “step in” if the feds try to deport “law-abiding New Yorkers.” How? By providing legal counsel. In the case of bias attacks, he counsels “call 911” – i.e., to bring in the racist NYPD! Yet what’s needed is to defy the repressive apparatus of the capitalist state, bringing the power of the multiracial, multiethnic working class into the fight at the head of all the oppressed. It is possible to stop deportations in this city where 40% of the entire population was born in another country. To do so requires using our power to bring the capitalist system to a grinding halt. Unions should be prepared to flood the streets en masse, physically blocking the migra thugs. If students’ families are picked up for deportation, their school should shut down – followed by others in solidarity. If a CUNY student is seized by ICE, there should be a citywide walkout by students, faculty and staff. And rather than impotent consumer boycotts, New York City has a powerful working class consisting of transportation, education, construction, health and food service workers who together with students can paralyze the center of finance capital with strike action. MTA workers showed the way in 2005 before they were sold out.